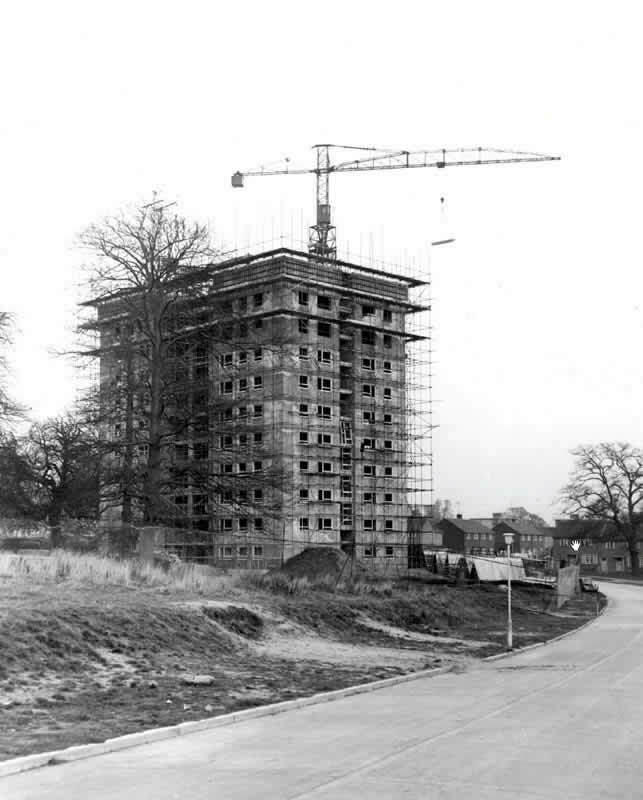 When the three high-rise apartment buildings (aka the '15 storey flats') were completed in the early 1960's they became an integral part of the Coley Park community. 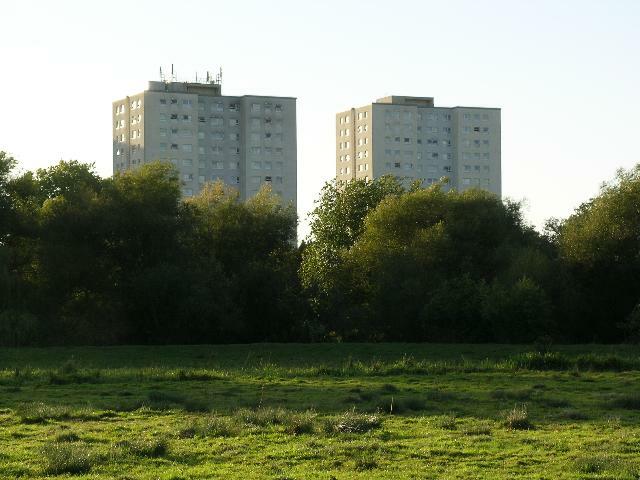 At a height of almost 50 metres they have a commanding view over the Kennet Water Meadows and neighbouring suburbs and are clearly visible from many kilometres. 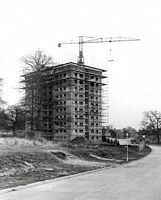 Construction started around 1959 to build three fifteen storey flats on a large circuit of vacant land bordered on all sides by Wensley Road in Coley Park. 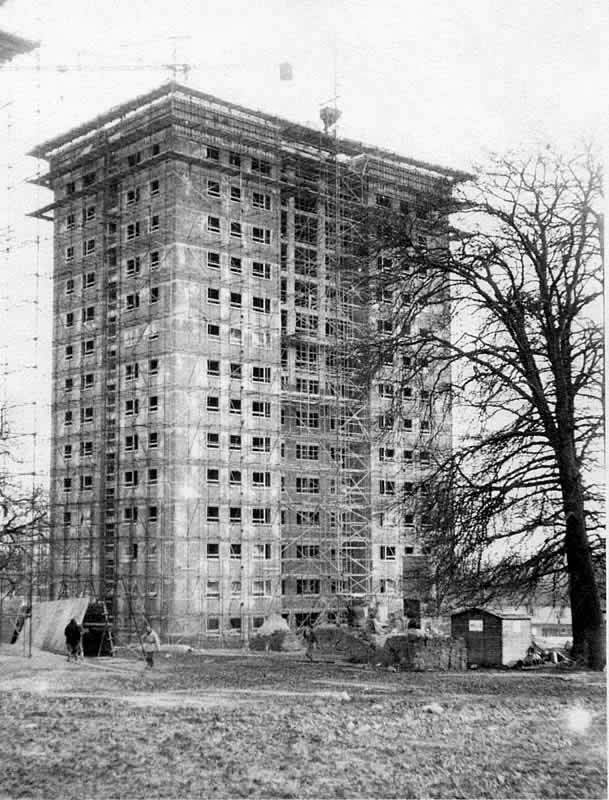 Built amidst a number of large Oak trees the flats were the tallest buildings in Reading at that time at a height of 160 feet or 49 metres. The project was managed by Wimpey Constructions. 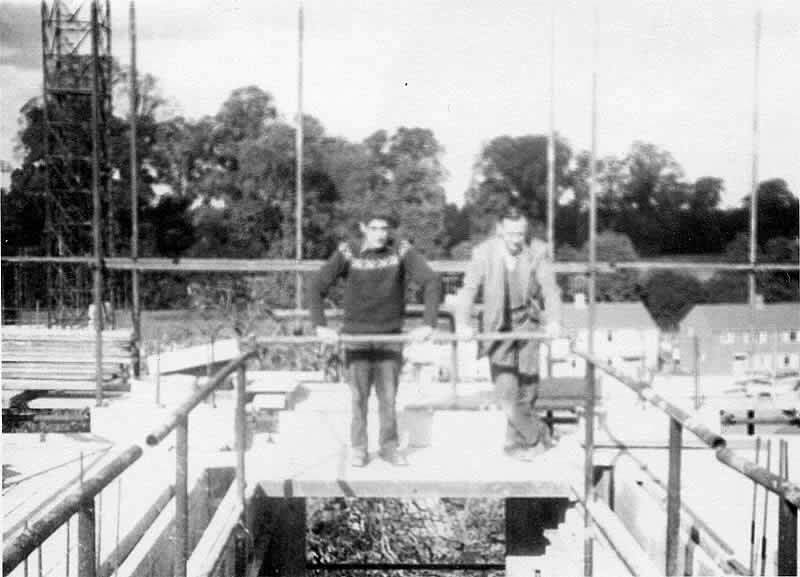 The late Ron Rosier, a carpenter and joiner, worked on the construction of these flats and thankfully shot a number of black and white photographs which capture the various stages and some of the men who worked on the construction. 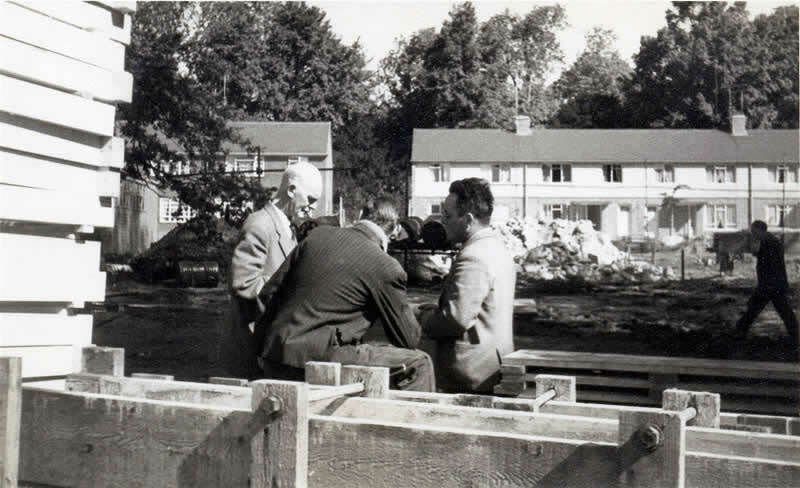 He also had previously worked on the construction of the Southcote mid-rise flats and later went on to work on the then new Coley Park Primary School also located on Wensley Road. 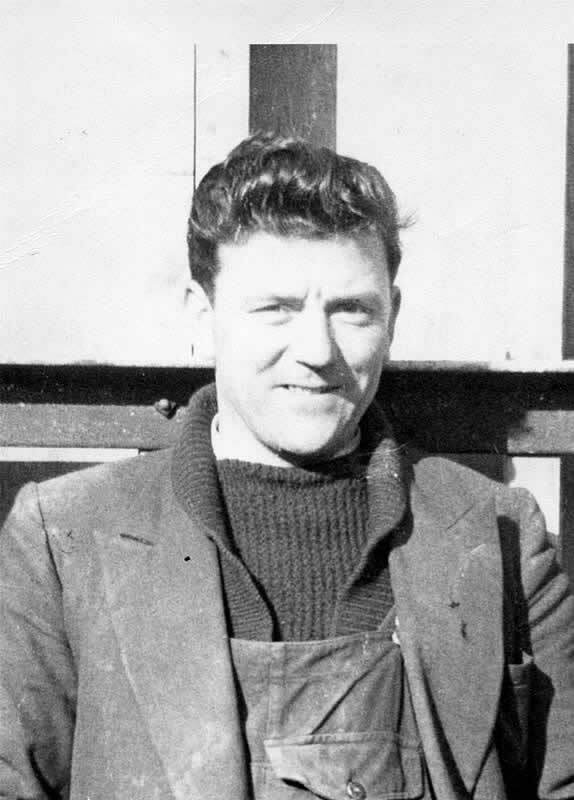 Walter Leitch was a carpenter that worked on the construction of the 15 storey flats and other Wimpey construction sites. His contribution to this website is gratefully acknowledged. Many of the workers on this site had worked on other previous construction sites together. For example, the 8-storey flats built at Southcote in 1958 and the Sainsbury's building on Friar Street, Reading. 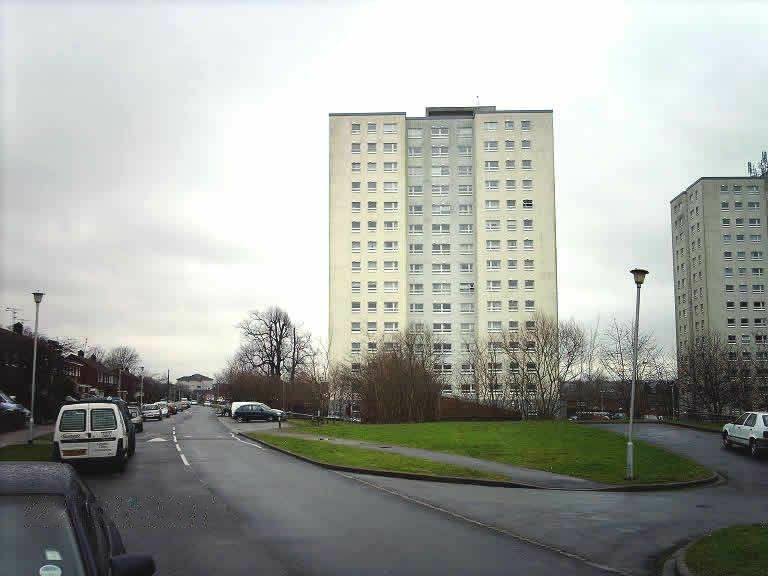 The flats were built by the Wimpey Construction company, with some work sub-contracted to Mills. Though the basic layout differs, the flats structural design was very similar to the 8-storey flats built by Wimpey Construction a year earlier at Granville Road in Southcote. 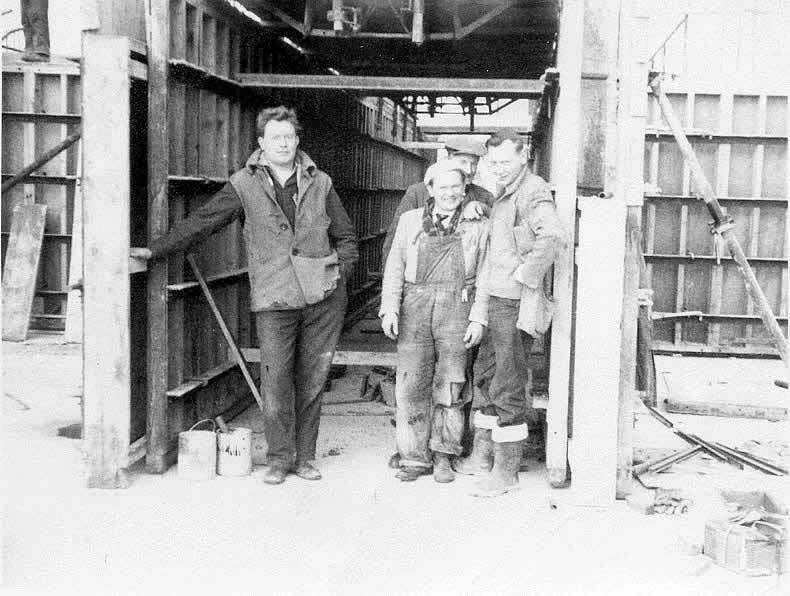 The General Foreman (left) discusses the progress near block #193. The other two men are unknown. The next stage of formwork is erected in preparation for the pouring of concrete. 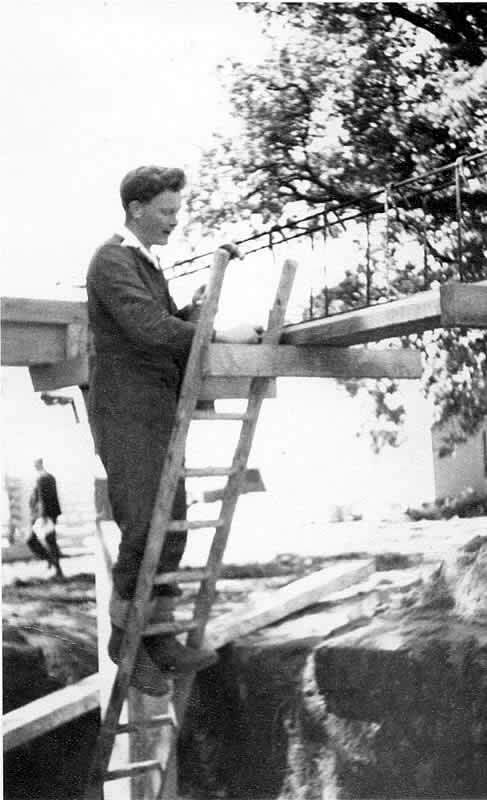 The workman in this photo was known as 'The Slinger' (attaches or slings chains for the loads dropped by the crane). 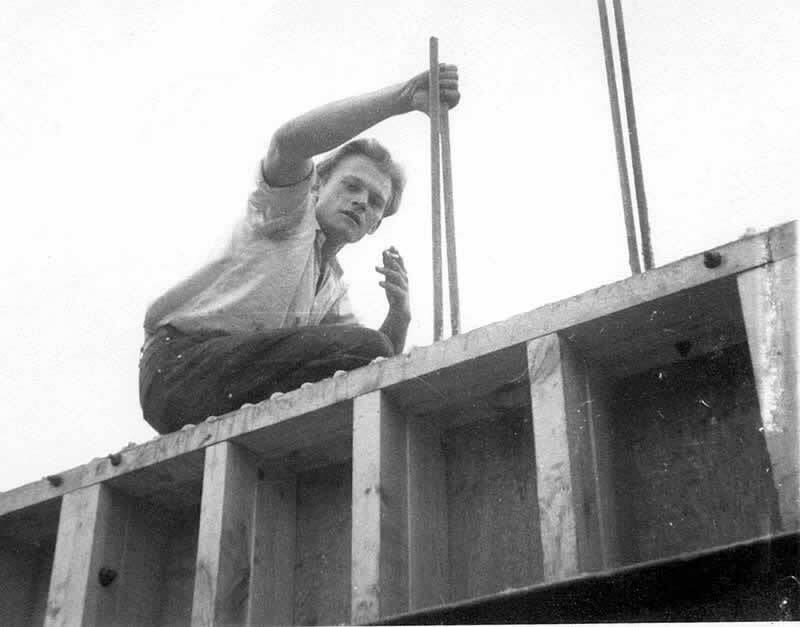 Walter Leitch positions a temporary support for the timber decking which will hold reinforced concrete when poured. 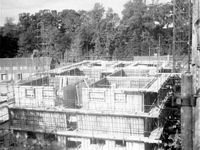 The method of construction consisted basically, not to be too technical, of the main supporting structure formed out of high tensile steel surrounded by well compacted concrete in the structural columns, beams and floors. 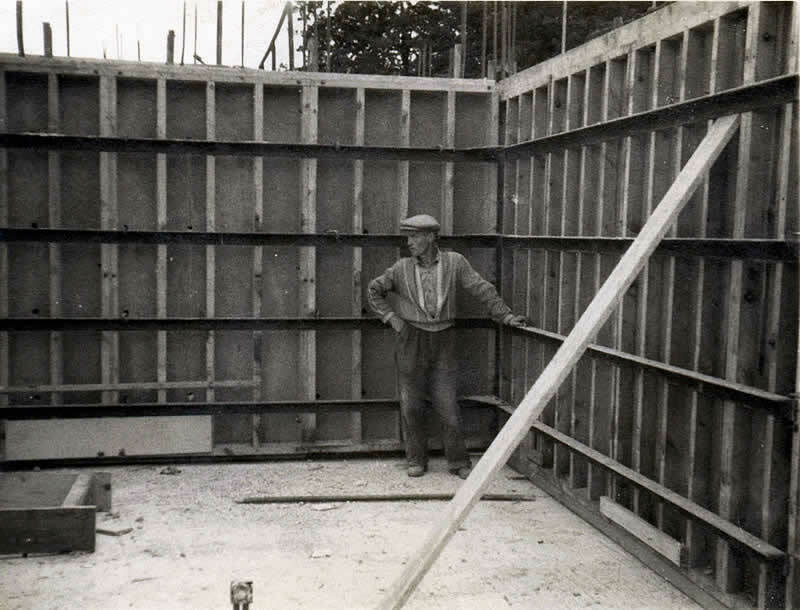 The infilling external wall fabric was made up of various sized aggregates, well mixed with a cement slurry, which when the whole lot came together was a type known as NO-FINES, and particular to Wimpey Construction (this method also being used by Wimpey on flats they built for the Liverpool Council). Windows were formed by heavy timber frames. 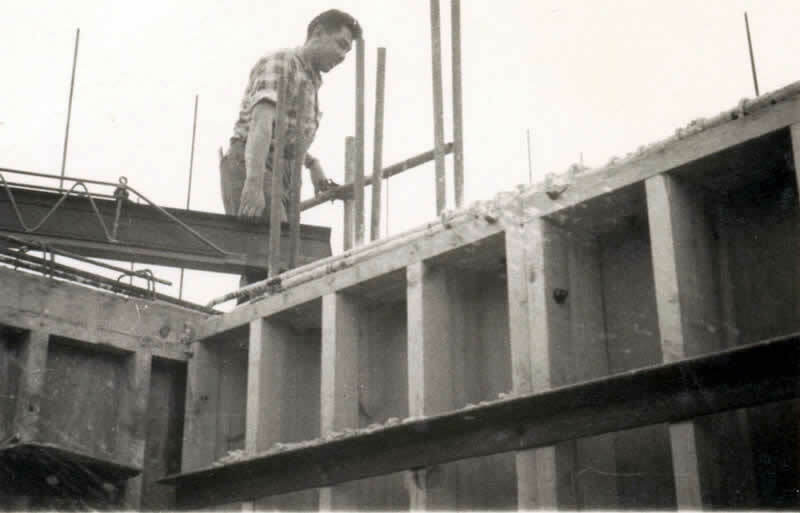 Safety was not so strict as today's building practices, and speed of construction was sometimes put ahead of safety and worksafe conditions. Thankfully, no one was seriously injured during the construction of the Coley Park flats. The three flats were numbered 193, 203 and 205 Wensley Road. Each block has 16 levels (including the ground floor) and approximately 89 residential units. 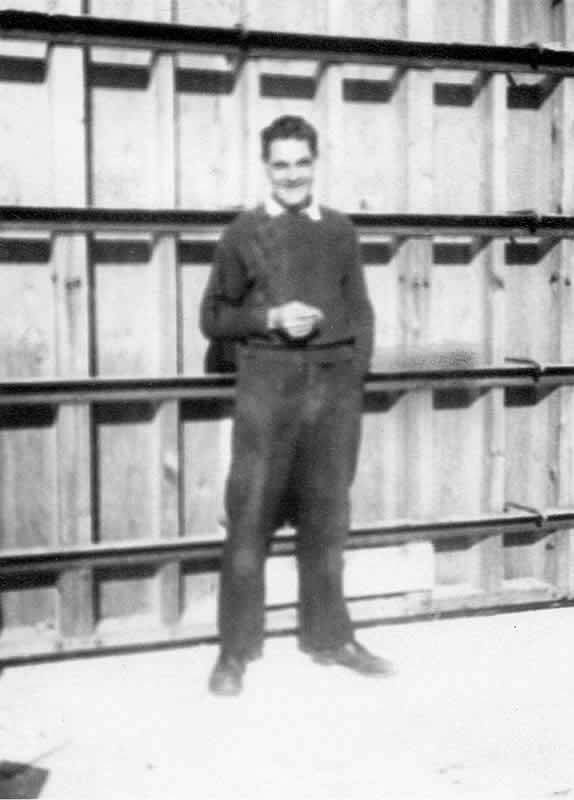 Carpenter, Colin Waring enjoying a quiet moment. Another check of the plans as work progresses. Lunch in the shade of the old oak trees. 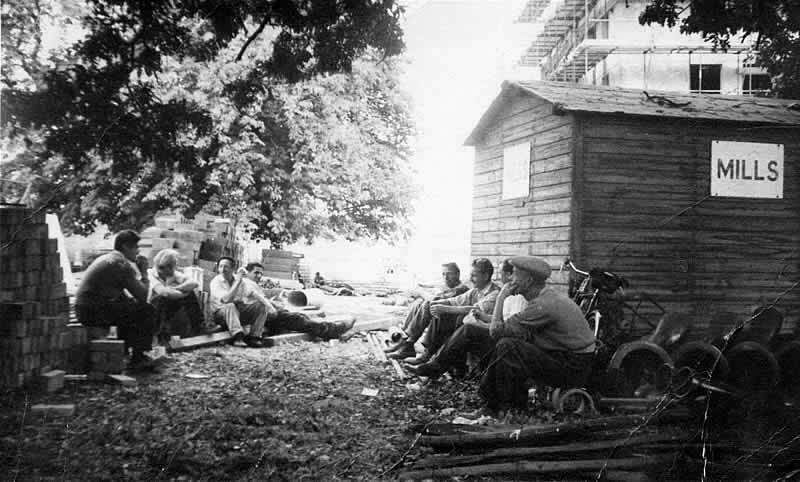 Two carpenter mates enjoying a well-earned rest. 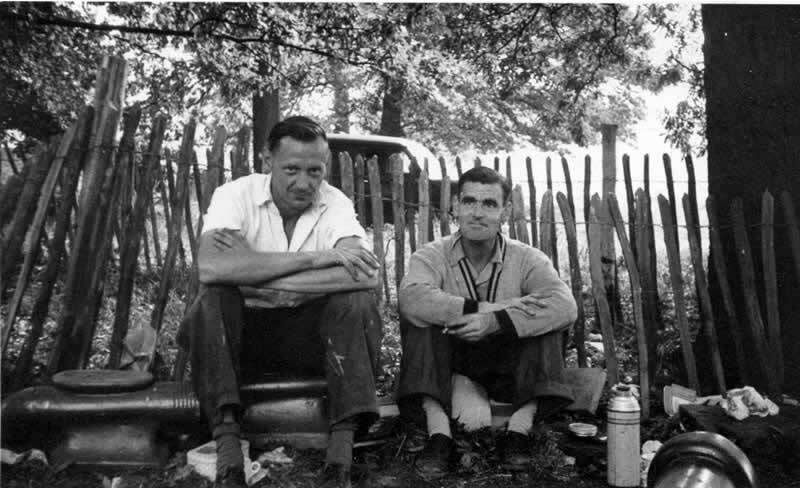 The man on the left was the charge-hand carpenter named Bill. 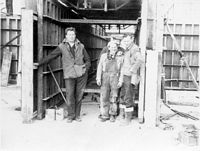 Some of the construction workers pose for photo. 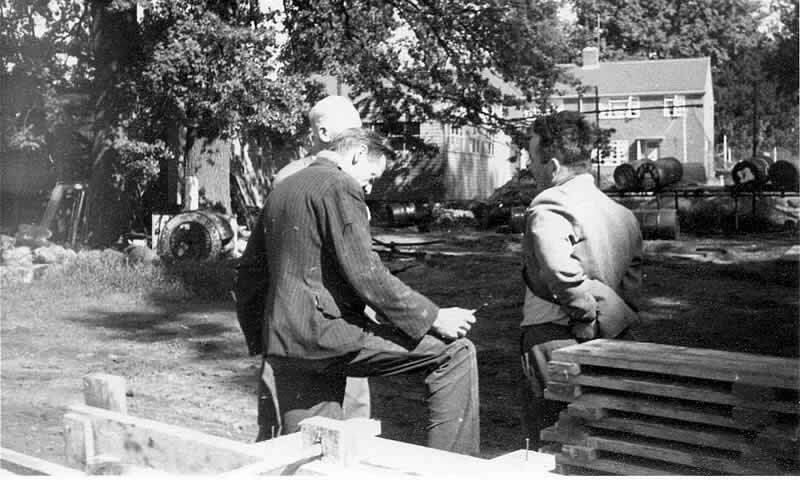 Possibly 'The Colonel' at the back with the cap and the chap on the right was the charge-hand carpenter named Bill. 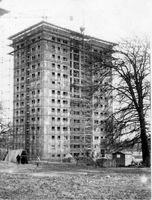 The north-side block (#193) has reached up to level 6. 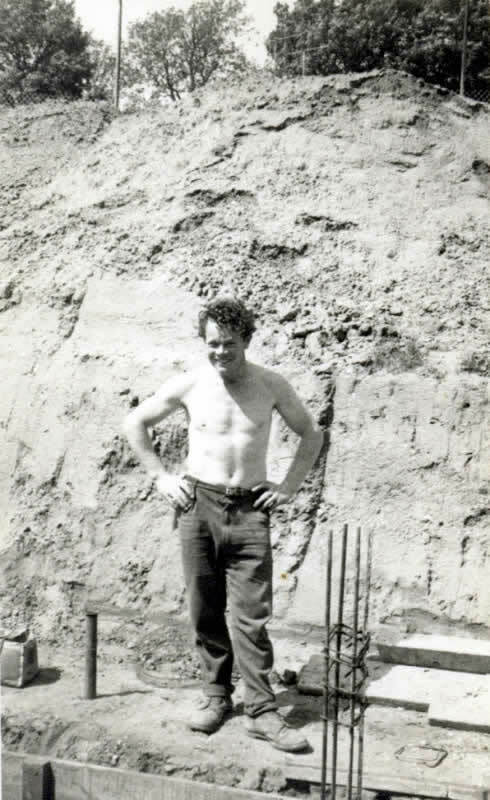 Ron Rosier, carpenter, took most of the photographs on this page. Unknown worker fixing timber formwork. 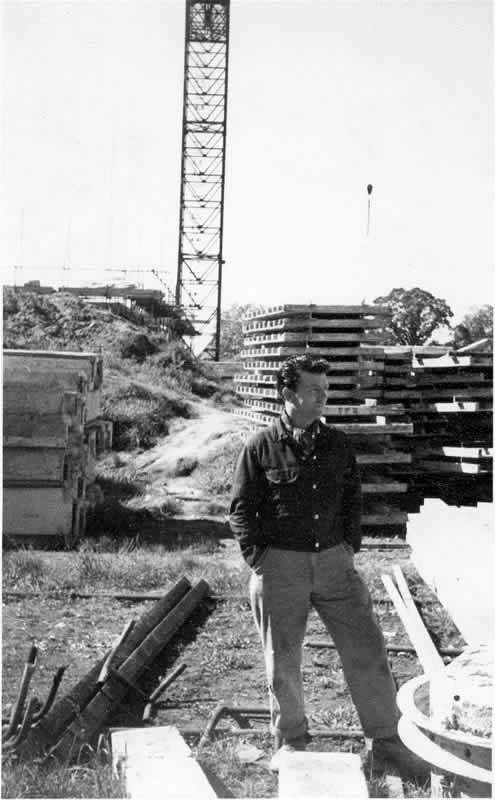 A smartly dressed Ron Rosier poses in front of piles of building materials. 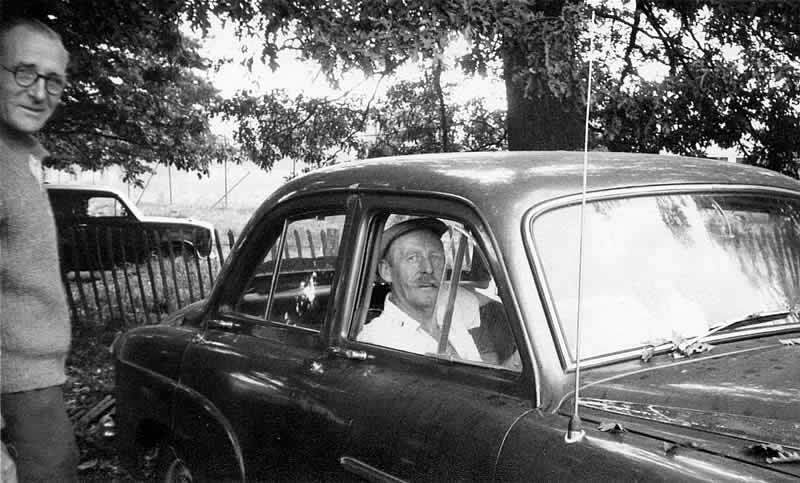 The chap in the car was another carpenter by the name of The Colonel due to his handlebar moustache. The person standing is unknown. 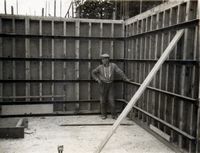 Poorer quality photo of unknown workman standing in front of the timber formwork. Block #205 Wensley Road reaches level 10. 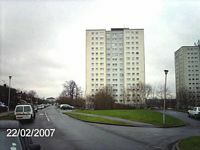 The three tower blocks were refurbished in 1993 by Architects ECD. The external colour of all three blocks was also updated, with a more modern looking silver-beige colouring replacing the original tired-looking brown feature colour. The old upper storey garages (near flat #193) were also removed. 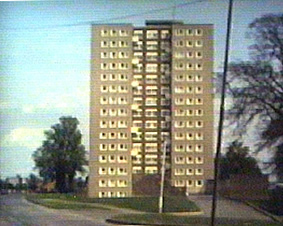 High Rise Flat #193 showing the original external colour. showing the new external colouring.